Interested in Becoming a Member of NAHEFFA? The services NAHEFFA offers are beneficial to all organizations which have the authority to provide capital financing for not-for-profit healthcare and higher education institutions. 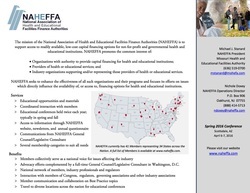 Educational opportunities in this ever changing industry along with communication from our Legislative Consultant and General Counsel located in Washington, D.C. are among the many services NAHEFFA offers. NAHEFFA Members collectively serve as a national voice for issues affecting the industry. NAHEFFA's advocacy efforts are complemented by our Legislative Consultant and General Counsel, Charles Samuels. Chuck provides us with constant communication from D.C. affecting our industry. NAHEFFA's national network of members and communication with industry professionals and regulators provide infinite resources. NAHEFFA offers two membership categories allowing for a more diverse network of members. Member - Any agency, department, authority, corporation or other entity which is an instrumentality of a state or local government and has the substantial purpose of providing capital financing for the development of health or educational facilities. Affiliate Member - Any public or not-for-profit private entity which has a primary purpose of health care or educational services. Contact Mike Stanard, Membership Chair or Nichole Doxey, Operations Director for more membership information.